The Mayor of Rugby, Cllr Tom Mahoney, and the civic party will walk from the rear of Lesley Souter House, in Whitehall Road, to the War Memorial gates in Hillmorton Road to participate in the parade and service. Representatives from around 20 contingents, including the 4th Battalion of the Parachute Regiment (D Company), the Royal British Legion, ex-service organisations, Girls' Brigade and Boys' Brigade, will gather in Hillmorton Road - between Whitehall Recreation Ground and Temple Street - at 10.30am to be reviewed by the Mayor before marching on parade to the War Memorial gates. Members of the public can attend the service and parade, which takes place from 10.50am to around 11.20am. During the service a two minute silence will be held. 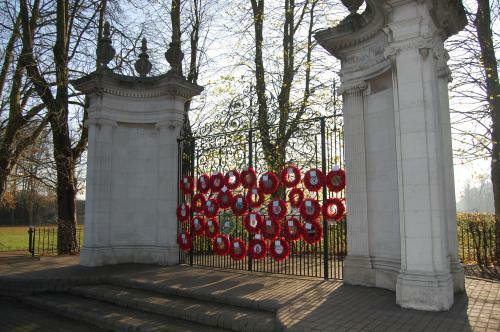 Members of the public can also join the Mayor and representatives from the contingents in laying wreaths at the gates. The Warwickshire and West Midlands Corps of Drums will provide the music for the service, which will be followed by a march past of all those on parade. The service will be led by the Reverend Imogen Nay, assisted by Father Tom Thomas. The exhortation will be given by Martin Myatt, of the Rugby No.1 branch of the Royal British Legion, while the Kohima Epitaph will be given by the Mayor's Cadet, Cadet Flight Sergeant Lewis Wakelin, from the 29F (Rugby) Squadron of the Air Cadets. Before the parade and service at the War Memorial gates, a parade of contingents departs from Caldecott Park at approximately 9am and walks to Whitehall Road via North Street, Church Street and Clifton Road. A rolling road block will be in place along the route from 9am to 10am. The following road closures take place on Sunday 11 November for remembrance services in the borough. North Street, Church Street and Clifton Road - rolling road block from 9am to 10am. Hillmorton Road (from Temple Street to the Whitehall Road roundabout) - 8.30am to 12 noon. Whitehall Road - 8.30am to 12 noon. Bruce Williams Way - 10.30am to 12 noon (pedestrian access to the Queen's Diamond Jubilee Centre maintained via Cromwell Road, the Hospital of St Cross and Bruce Williams Way). Main Street (from its junction with Magnet Lane to its junction with Church Walk) - 10am to 1pm. No access to Bawnmore Road from Main Street - 10am to 1pm. High Street (from its junction with Deerings Road to its junction with Fenwick Drive) - 10.30am to 11.45am. Brookside (from its junction with Kaysbrook Drive to its junction with Church Hill) - 10.20am to 10.30am. Church Hill (from its junction with Brookside to All Saints Church) - 10.20am to 10.30am.